If you haven’t already, pop your popcorn. 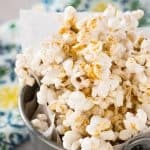 I prefer an air popper but you can also use the oil pop or brown bag microwave method just don’t use bagged microwave popcorn. While your popcorn is popping or before you get started with that, make your spicy nacho seasoning. Combine all the ingredients for the spicy nacho seasoning and store in an airtight container until ready to use. Spread your popcorn on a baking sheet. Spray the popcorn with a non-stick spray. I use a coconut oil spray. Sprinkle the Spicy Nacho Seasoning over the popcorn. Let dry for a few minutes. Enjoy now or store in an airtight container for up to 3 days. *If you like this recipe, please leave me a comment and rate it with some stars. Thank you!